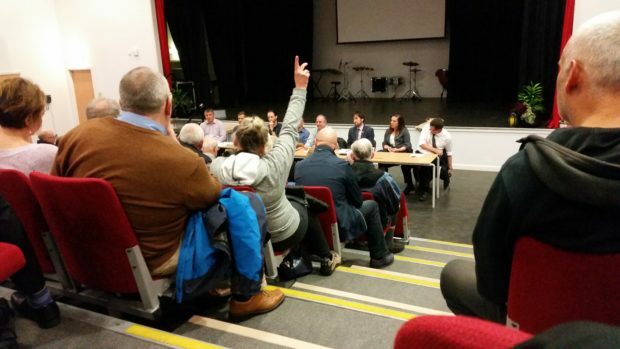 Residents of Portlethen attended a meeting at the school on Thursday evening. Residents of an Aberdeenshire village attended a fiery public meeting to try and find out who is to blame for a strange stink in the air that has blighted the area for decades. Dozens of people who live in Portlethen visited the local secondary school this week to demand action be taken to address the smelly issue. Hard questions were put to representatives from Scottish Water, the Scottish Environmental Protection Agency (SEPA), Aberdeenshire Council’s environmental health department and McIntosh Donald – the abattoir some believe to be the source of the stench. Many in the area have long apportioned blame for the pungent aroma to the meat processor on the town’s Cookstown Road. Other residents believe the problem could be caused by a leaking Scottish Water sewer pipe. The meeting was organised by Portlethen and District Community Council and first heard from Craig Adam, site manager at McIntosh Donald, which employs 340 staff. Mr Adam insisted that the business does all that it can to eliminate any potentially smelly impact it has in Portlethen – where he too is a resident – including blocking off drains to prevent odours escaping. James Smith from the local SEPA team also addressed the audience and detailed all the work the organisation has been doing to determine the source of the stink. He appealed for all residents to report any unwelcome aromas to the agency, with any identifying details, as soon as they catch a whiff. During the meeting, one angry resident told the panel she is considering selling her home. She said: “There are a multitude of problems in Portlethen that need to be addressed by the council, by SEPA, by Scottish Water and by McIntosh Donald. “I’ve lived in Portlethen for 16 years and recently moved to Dunvegan Avenue, where I thought everything would be fine, but now I want to put my house up for sale. “This is something that is clearly ongoing. It’s embarrassing. “I have people coming round wanting to see my new house, but when they get there all they can say is, ‘what’s that horrible smell?’. At the conclusion of the meeting, representatives from the groups present resolved to have a further meeting with Portlethen and District Community Council to discuss the matters raised. Council environmental health officers visited the area and Scottish Water staff have also surveyed parts of the sewage network in near Cookston Road. An Aberdeenshire Council spokesman said: “While the source of the odour remains unclear, the council will endeavour to support partner agencies in their investigations going forward and will provide regular updates to the community council. This is not the first time a north-east community has complained of strange smells lingering around their houses. A little further up the coast, residents have been up-in-arms about the so-called “Torry Pong” for years. Initially the bad smell was blamed on a fault at the £63million waste water works plant at Nigg, which was built in 2001. However even after repairs, it can still be smelled on and off some 17 years later. This prompted the chief executive of Scottish Water to commission an independent expert to look into the problem and come up with a solution once and for all in 2015. But by examining historical wind patterns, Professor Rob Jackson revealed that not all of the smells could have come from the plant, as the breeze had picked up scents from elsewhere. And while a large question mark remains over exactly what caused these stenches, the research was wound up earlier this year as the number of complaints dropped from more than 20 per month to an average of just one.